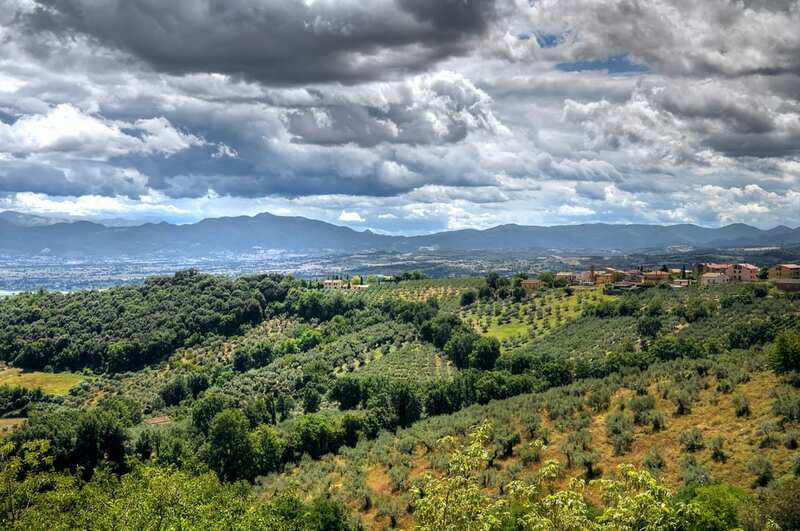 Home » All Articles » Tuscany » Umbria vs. Tuscany: Which Region Should You Travel To? This gorgeous scene happens to be in Tuscany.... but Umbria is spectacular, too! Umbria and Tuscany are, without a doubt, two of Italy’s most beautiful regions. And they have a lot in common. Both are famed for their rolling hills and vineyards, medieval hilltowns and fantastic food. They’re also right next to each other, located right in the center of Italy. But the regions are different. (Just ask Italians who live in Umbria or Tuscany themselves: Needless to say, they have quite the rivalry with the other region!). Trying to decide whether to do a day trip or (better yet!) a longer trip to one of the two regions? Here’s some help! The view from Montefalco, Umbria. Gorgeous! If you’re after rolling hills and cypress trees, olive groves and sparkling lakes, medieval hilltowns and spots of thick forest, either region will do the trick. The one thing Umbria doesn’t have? A coastline. Umbria is land-locked, so if you’re dead set on making it to the sea, then Tuscany is your best bet. Just keep in mind that most of Tuscany’s best beaches are in the Maremma area, which is a more than 2-hour drive from Florence. By car from Florence, you can get to both Tuscany (of course) and Umbria easily. You’re in Tuscany, after all, and reaching some of Tuscany’s more beautiful countryside areas—the Chianti wine-making region, for example—takes just a half an hour’s drive. It’s a little further to get to Umbria, but still close: In an hour and a half on the road, you cross the border from Tuscany into Umbria and can be in the area of Lake Trasimeno, Chiusi, and Perugia. (On a train, Florence to Perugia takes two hours). If you want to take in the grandeur of Tuscany (and sip some fine Chianti) without having to navigate the country roads, we’ll drive you ourselves on our Tuscan Day Trip from Florence. (By the way, don’t miss our adventure through Tuscany’s most stunning scenery, in video!). Meanwhile, from Rome, Tuscany’s a bit farther than Umbria. It takes two hours to drive from Rome to Pitigliano, a lovely town right over the border from Lazio in Tuscany. Umbria is much closer: It takes one hour to drive to the medieval hill town of Narni, or 1 hour 15 minutes to drive to Orvieto. (On the train, both Rome to Orvieto and Rome to Narni-Amelia take as little as an hour). If you’re planning on taking public transport around Umbria, don’t miss our post on how to travel Umbria by train and bus. Don’t let friends who have traveled to Tuscany and only visited the tourism hotspots tell you anything different: Tuscany does have medieval towns and stretches of countryside that remain unvisited by big tour buses and untrampled by tourist hordes. Because Umbria is less famous than Tuscany, though, there are more of these off-the-beaten-path gems in Umbria. Where Tuscany’s most beautiful towns and rural areas have become famous—and, therefore, more touristy—Umbria’s best offerings remain little-known. Like Spoleto, Spello, Todi, Montefalco, Norcia, Narni, Amelia, Bevagna, even Perugia. And that’s not to mention all of the really tiny towns that receive no tourism whatsoever, towns that you discover simply by driving around the countryside. Especially if you do go off the beaten path. 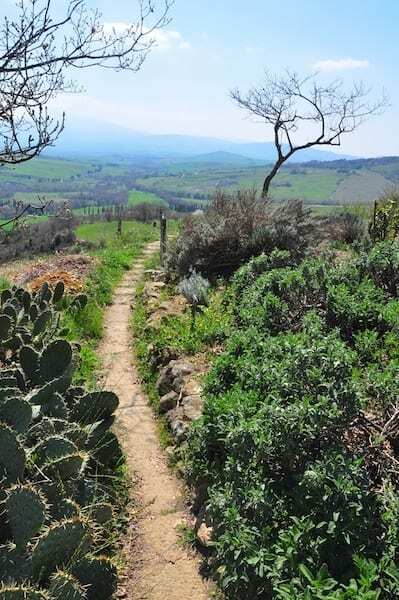 There’s less tourism in Umbria (although the region is getting more popular all the time), so most things, from eating out to staying at a villa or agriturismo, will cost you less than it would at its Tuscan equivalent. Although it’s a much smaller region, Umbria produces some great wines, like the world-renowned Sagrantino wines or its DOC-protected Orvieto wines. If you’re determined to try Italy’s most famous labels, then Tuscany is your best bet. Tuscany has the most famous, and established, labels. After the Veneto and Piedmont, Tuscany produces Italy’s highest number of DOC/DOCG wines, and wine country is spread throughout the whole region. 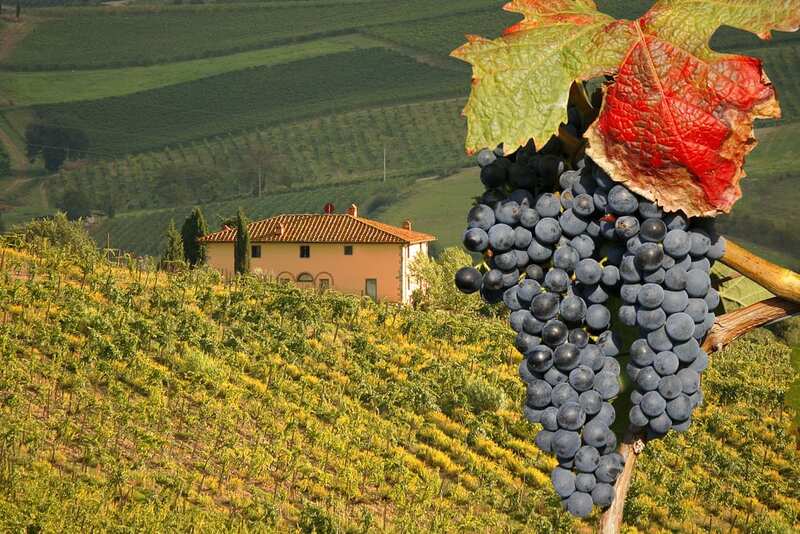 Which wines are produced in Tuscany? Chianti, Brunello di Montalcino, Vino Nobile di Montepulciano, and Vin Santo are some of the big guys, not to mention the Super Tuscans—wines that are considered some of Italy’s best, but don’t follow the restrictions that govern DOC or DOCG-protected labels. After all, they are right next to each other. And they each have a lot to offer! Your website is fantastic! We are planning a family trip to Italy in mid-June this year. We would like to stay for 2 weeks in a location that we can use public transport or walk in the village. Would Tuscany be a good location for a family to enjoy walks? Is mid-June warm enough to swim in this region? Do you have a better suggestion? June in Tuscany is not only beautiful, it will almost certainly be warm enough to swim. Most of the hilltowns in Tuscany are so small you can easily walk the length of the town, but if you’d like to use public transportation to visit multiple towns, we suggest you stay in one big enough to be well connected, such as Siena or Lucca. You can check trenitalia.com to see train connections and times. Our Top 10 Towns of Tuscany post might help you decide where to stay!